" The ineffectiveness of air attack against tanks should have caused no surprise because the weapons available to the fighter-bombers were not suitable for destroying them. Put simply, the heavy machine guns and 20 mm cannon were capable of hitting the tanks easily enough, but insufficiently powerful to damage them, except occasionally by chance. The RPs and bombs used were certainly capable of destroying the tanks but were too inaccurate to hit them, except occasionally by chance." Experience showed that the best way of knocking out tanks was to use a cannon powerful enough to penetrate the armour. This article examines the weapons used and takes a retrospective look at an 'ideal' airborne anti-tank armament. A wide variety of airborne anti-tank guns was fielded by three nations: the USSR, Germany and the UK. The USA developed one, but did not use it. This section describes their characteristics, but the armour penetration figures need to be regarded with caution because of the varying standards of measurement used in different countries. The variations not only include the usual parameters of striking distance and angle, but also the quality of the armour and the definition of 'penetration'. Also, some figures resulted from ground tests, others allowed for the extra velocity imparted by the speed of the aircraft. The USSR fielded two guns in the anti-armour role, and tested a third. The 23 mm VYa and 37 mm NS-37 were developed specifically for aircraft and used in both the air combat and anti-tank roles. The NS-45 was a version of the NS-37, with the cartridge case necked out to 45 mm. It was tested in air combat and proposed for various anti-tank aircraft, but not adopted. The VYa was a gas-operated, belt-fed gun (a scaled-up 12.7 mm Berezin) chambered for a powerful 23 x 152B cartridge. It is credited with penetrating 30 mm at 100 m and 25 mm at 400 m (striking angle unspecified). This was adequate against light tanks but not enough to reliably penetrate medium tanks. The NS-37, unusually for the USSR, used a short-recoil mechanism and was belt-fed. It was a particularly slim weapon, with a compact mechanism, suitable for fitting between the banks of a liquid-cooled vee-engine to fire through the hollow propeller hub. The powerful 37 x 195 ammunition is quoted as penetrating 48 mm / 500 m / 90 degrees, enough to pose a threat to the side or rear armour of virtually any tank. The 45 x 185 cartridge of the NS-45 increased this to around 58 mm. All of the Soviet guns used conventional full-calibre steel shot, fitted with a windshield to improve the ballistic coefficient. This is rather surprising, as they used the much more effective tungsten-cored projectiles in ground anti-tank guns. Germany fielded several different guns in the anti-tank role. The first was the 30 mm MK 101, which used powerful 30 x 184B ammunition. This was later supplanted by the MK 103, which used an electric-primed version of the same cartridge, with the same performance. The MK 101 used a short-recoil design, and in its anti-armour role was fed by a 30-round drum. The more compact and faster-firing MK 103 used a hybrid gas+recoil system and was belt-fed. Various AP rounds were used, but the most effective was the Hartkernmunition, which had a penetrating core of tungsten carbide sheathed in a light-alloy shell with a sharply-pointed profile. This could penetrate 75-90 mm / 300 m / 90 degrees (depending on the type of armour), dropping to 42-52 mm when impacting at 60 degrees. The remaining German guns were all adaptations of ground guns. The first was the 37 mm BK 3,7, a modified version of the FlaK 18 AA gun firing the same 37 x 263B ammunition. This meant that it was bulky, heavy and slow-firing by comparison with the NS-37, for example. It also remained clip-fed, with a maximum capacity of just 12 rounds. It mainly fired Hartkernmunition ammo, capable of penetrating up to 140 mm / 100 m / 90 degrees although this was halved at a striking angle of 60 degrees. The remaining German guns were adaptations of ground anti-tank guns with long-recoil mechanisms, and saw little use. These were the BK 5 (also briefly used for air combat in the anti-bomber role) which was a PaK 38 fitted with an autoloader and a 22-round magazine for its 50 x 419R ammunition. It is unclear whether this saw action in the anti-tank role. More famously, the PaK 40, which fired massive 75 x 714R cartridges, was used in two versions; a semi-automatic one with a 10-round vertical magazine, and the fully-automatic BK 7,5 with a 12-round rotary magazine. This could penetrate 132 mm / 500 m / 90 degrees (104 mm / 500 m / 60 degrees) when used on the ground, so was clearly capable of dealing with the toughest tank. Both BK 5 and BK 7,5 fired the normal APCHE projectiles, which were more destructive and reliable in their penetration than the Hartkernmunition rounds, being less affected by unfavourable striking angles or add-on armour plates. The British fielded only one airborne gun in the anti-tank role: the Vickers Class S. This was designed around the naval 40 x 158R AA case, with special armour-piercing loadings. As such, it was much less powerful than the Army's 2 pdr anti-tank gun, but the attack speed of the aircraft helped to provide a penetration quoted as 50-55 mm (range and striking angle not specified). This was a long-recoil gun which was fed by a 15-round drum (a sixteenth round could be carried in the chamber). A 30-round drum and a belt-fed version were developed but not adopted. The same fate befell an interesting adaptation to use the Littlejohn squeezebore shot. The AP projectiles fired were full-calibre steel shot, without even a ballistic cap. The British developed other weapons for this purpose. The 6 pdr (57 mm) Molins gun was intended for this role, but used only by Coastal Command. The 47mm Class P gun was not ready until after the war. The USA did fit one 37 mm gun to its aircraft - the M4. However, this fired low-powered 37 x 145R ammunition and was not very effective against tanks, being intended for air combat. Much more impressive was the M9, which was a belt-fed development of the Army's M1 long-recoil AA gun and fired a powerful 37 x 223SR cartridge. Special AP loadings were developed for this gun but it was never used in action. The following illustrations show most of the cartridges listed above (except for the 37 x 223SR which did not see service). 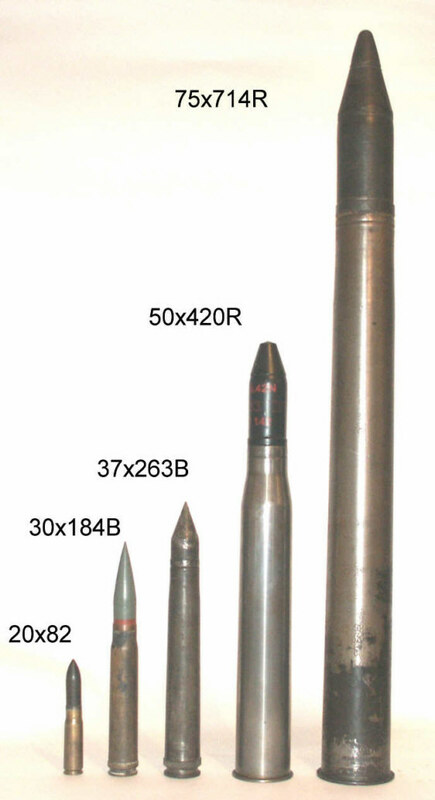 Above: cartridges of up to 40mm used in ground attack, starting with the .50 Browning (12.7x99) and 20mm Hispano (20x110) to give an idea of the relative scale and power. 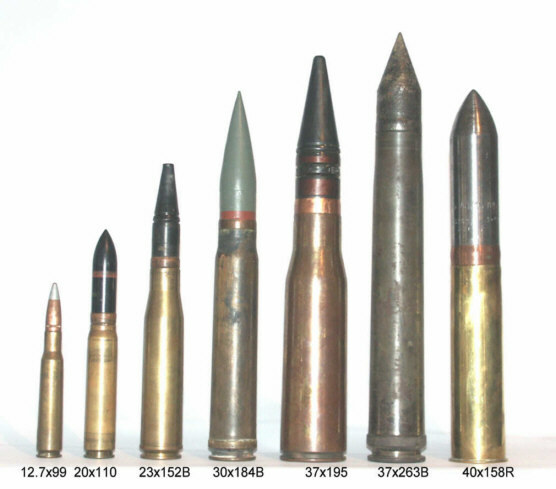 Above: German airborne armour-piercing rounds, starting with the 20 mm Mauser (20 x 82) and concluding with the big BK 5 (50 x 420R) and BK 7,5 (75 x 714R) rounds. Looking at the targets which the guns had to deal with, it would seem that for the weapon to be useful against any tank on the battlefield, the minimum performance should be a penetration of 100 mm / 300 m / 90 degrees, and 60 mm / 300 m / 60 degrees. If conventional steel shot were used, then a gun as big as the BK 5 would be required to give such performance. This argues in favour of using tungsten-cored shot for this purpose (despite some disadvantages), in order to keep the gun relatively light and compact. The required performance is a bit better than the MK 101/103 achieved firing tungsten-cored shot, which in 30 mm calibre indicates that a muzzle energy of around 200,000 joules would be sufficient. Interestingly, the current 30x173 API loading for the GAU-8/A used in the A-10 tankbuster develops 207,000 joules, and also uses a Hartkernmunition shot, although with a depleted uranium rather than tungsten carbide core. In WW2 the 30 mm guns were criticised for the limited behind-armour effect of their small penetrating cores (less of a problem for the GAU-8/A: an advantage of DU, apart from 10-15% better penetration, is that it has an incendiary effect after penetrating). This argues in favour of a 37-40 mm gun to provide greater effectiveness. A larger calibre would also provide more effective HE shells for use against softer targets. Studying the figures, it looks as if a a muzzle energy of around 250,000 joules would be needed in 37 mm calibre. The ideal loading would use a heavier projectile than the rather light 405 g shot of the BK 3,7 in the interests of better performance at long range (the weight of the GAU-8/A's 30 mm DU projectile is 425 g). On the other hand, a high velocity is also desirable to flatten the trajectory and minimise the flight time, thereby increasing the hit probability. A reasonable compromise would be 500 g at 1,000 m/s, which works out nicely at 250,000 joules. Alternatives would be 555 g at 950 m/s, or 615 g at 900 m/s. This is actually less powerful than all of the service 37 mm AT guns, so we can use a smaller and lighter cartridge case; similar to the NS-37's, but a bit slimmer. What of the gun? Clearly it should be belt fed, in fact ideally with a double-belt feed so that the pilot could switch between AP and HE ammunition as required; that would be cheating a bit as double-belt feeds didn't enter service until after WW2, but it was a straightforward engineering task so could have been introduced earlier if the need had been identified. The choice of mechanism is interesting: the best performer in terms of rate of fire was the NS-37, but that used a short-recoil mechanism which imposed considerable stresses on the aircraft carrying it (the initial aircraft installation, mounted to the engine, resulted in a cracked engine block). A long-recoil design like the Vickers Class S had only half the rate of fire, but the recoil was moderated into a smooth push which was much easier to manage. This not only meant fewer installation problems, but also reduced the disturbance to the aircraft, making it easier to keep the sights on target during a firing pass. A weight of around 150 kg, a length of 3 m and a RoF of 150 rpm would seem reasonable targets. Ammunition capacity should be at least 30 rounds per belt; normally one belt of AP and one of HE, although that could be altered depending on the circumstances. The Gun Carriers: what of the aircraft? There were various possible locations for heavy cannon, but they all boiled down to two basic types - wing or fuselage mountings. Wing mountings had several disadvantages. First, they suffered the usual problems with this location of harmonisation; that is, the guns had to be angled inwards to coincide with the sight line, and this could only be for a specified distance. At much shorter or longer distances, the projectiles would not strike where the sights were aimed. Incidentally, it is worth mentioning that with all guns, wherever mounted, there was also a vertical harmonisation issue, in that projectiles followed a curved trajectory so at much shorter or longer distances they would strike above or below the aiming point. However, this would be much less of a problem with a high muzzle velocity. Other disadvantages of wing mounting peculiar to heavy cannon were, obviously, that the weight and drag penalties were much greater than with one fuselage-mounted gun, the wings were more flexible not just in flight but also under recoil (which affected accuracy) and the plane could be moved from side-to-side by the recoil if the guns fired at different moments, further affecting accuracy. The guns were also mounted under the plane's centre of gravity, which meant that recoil pushed the nose down on firing. All of this added up to less accuracy and lower aircraft performance with wing-mounted cannon. This is significant because most single-engined aircraft fitted with large cannon had no option but to fit them under the wings, as few vee-engines, and no radials, were compatible with the engine-mounting of the gun to fire through a hollow propeller hub. In theory, a gun could be mounted under the belly of the plane and synchronised to fire through the propeller disk, but in practice this became more problematic as the size of the cartridge case increased because of the variations in the burning time of the propellant (the Luftwaffe considered but rejected such an installation of the MK 103 in the Fw 190 for this reason). Of course, none of these problems bothered twin-engined aircraft, which were able to employ a rigid central mounting in or under the fuselage, directly under the sights, to the great benefit of accuracy. They also usually had a much better forwards and downwards view (important for a ground attack plane), although blocked to the side by the engines. However, most twins were much bigger than singles, making them much bigger targets for ground fire. Attempts to use Ju 88s in the anti-tank role led to catastrophic loss rates. The only exception was the Hs 129, a very compact plane. However, while that was probably the most effective of all the anti-tank aircraft, it had a low performance and was relatively helpless against enemy fighters, not even having the benefit of a rear gunner. The table below lists some aircraft which were used, or potentially useful, as anti-tank planes. Wing area is an indicator of apparent size, and therefore the risk of being hit by ground fire (although for a given wing area, twin-engined planes usually presented a bigger target). Wing loading is a double-edged sword: a low wing loading was useful for a good short-field performance and low-speed manoeuvrability, but a smaller wing was less disturbed by low-level air turbulence and therefore (other things being equal) was likely to provide a more stable gun platform for ground attack. The power loading (as with the wing loading, taken at maximum loaded weight) gives an indicator of performance. Of the single-engined aircraft, the Yak-9T and P-39 were not intended as ground attack planes, but they had the potential as their layouts permitted the carrying of heavy guns. The Whirlwind was considered for mounting a 40 mm S gun in the nose, and as it was no bigger than the Hs 129 it might have made a good tankbuster - if it weren't for those liquid-cooled engines. An alternative engine available at the time was the Bristol Taurus, a slim, two-row, air-cooled radial which weighed about the same but was more powerful. The potential was clearly there. One twin-engined fighter was designed around this engine; the Gloster F9/37. It was built and tested, and proved to have a high performance and excellent handling, but was one of those unlucky planes which was not ordered despite its qualities. It would presumably have weighed quite a lot more in ground-attack trim, with armour and a heavy gun, but had the advantage over the Whirlwind of a forward cockpit, giving excellent forwards and downwards visibility. Of the other twins, the P-38 and Mosquito (the 'Tsetse', with a 57 mm Molins gun) were also handicapped by liquid-cooled engines. The Tsetse was originally conceived as an anti-tank plane, but not used for that purpose. The gun was accurate and effective, so it was the plane's vulnerability which must have counted against it. The Beaufighter had air-cooled radials and a reputation for toughness, but the sheer size of this beast seems to have ruled it out of consideration for the anti-tank role. The Ilyushin Il-2 and Ju 87G were effective armoured attack planes. Although equipped with vee-engines, they were handicapped by installations which did not permit an engine-mounted gun, so they had to carry their armament in or under the wings (in the case of the Ju 87G, the BK 3,7 was far too large to fit in an engine mounting anyway). This gave them poor performance by comparison with fighter-bombers, and they were vulnerable to fighters, although they did have rear gunners to keep a look-out. Our search for an anti-tank aircraft, which combines carrying a powerful cannon with enough performance and agility to defend itself against fighters, therefore results in two main options: a small, fast twin like the hypothetical Taurus Whirlwind, or a single-engined plane able to take a nose-mounted cannon, which leaves us with the Soviet Yak-9 (and the inferior LaGG) and the American P-39 (and P-63 development). The Yak-9T, with one NS-37 mounted on the engine and a synchronised 12.7 mm Berezin, was a good fighter well able to look after itself, but it wasn't perfect in the anti-tank role. The gun's heavy recoil pushed the nose out of alignment, so only two or three shots could be fired before the pilot had to correct the aim, and it carried insufficient armour to protect its vulnerable engine cooling system from ground fire (it took only a single bullet to penetrate the radiator or coolant lines of a liquid-cooled engine to ensure that the plane would not return to base). There was also room behind the engine for only 32 rounds of cannon ammunition. Our 'ideal' gun would be a bit lighter, and the ammunition would be slightly smaller, allowing weight and space for more armour and ammunition (or alternatively an additional Berezin). However, to provide the kind of comprehensive armour protection carried by the Il-2 would probably have crippled the performance. The P-39 had in some ways a better layout than the Yak-9. Locating the engine behind the pilot left the entire nose clear for armament, which enabled the bulky M4 cannon (with 30 rounds) plus a pair of .50 Brownings to be fitted. The later version of the gun, the M10, had belt feed allowing no less than 58 rounds to be carried in the later marks of P-63. One prototype P-63D was fitted with the much more powerful 37 mm M9 cannon described above, which could have had considerable anti-tank potential. However, like the Yak-9 the plane was powered by a liquid-cooled engine, which would have required substantial additional armour to protect the cooling system from ground fire. The synchronised .50s were also rather slow-firing, and the forward position of the ammunition supply meant that the handling was affected as the supply was used up. Ground-attack planes were much better with air-cooled (i.e. radial) engines, as they avoided all of the vulnerabilities of the liquid cooling system and therefore needed less comprehensive armouring, to the benefit of performance. In theory, the P-39 layout could have been used with a radial engine although providing adequate cooling would have been difficult. A better solution technically could have been a twin-boom radial pusher, with the cockpit mounted well forward (improving forwards and downwards visibility) and the gun mechanisms and ammo supply behind the cockpit. The accompanying HMGs also would not have needed to be synchronised. This layout would have carried some structural weight and aerodynamic penalties, but would have made an interesting alternative to the options available in World War 2.